Do you suffer from recurring headaches? Maybe you’ve tried countless things to relieve your pain. Wouldn’t it help you to keep track of your headaches, disability, medications taken, and triggers as you have your headaches? 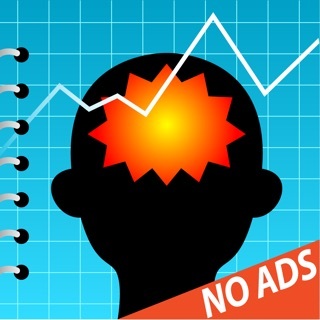 Use the most popular headache diary on the app store (over 180,000 downloads to date)! "Loved the app and the new update makes tracking the migraines even better. Being able to note the possible triggers and then add my own notes for each headache is a big plus." "I liked the app before, but now it is perfect. My doctor loves the reports and now he is even telling his patients to get it. The triggers and notes work great. Thanks for making this app." When you see the doctor he needs information about your headaches to help you but you’re stumped by the questions that need answering. • How many headaches you are having? • How disabling are they? • What medications are you trying? • Are your headache preventatives working? • Are there any triggers you can identify? When you’re enduring a headache, keeping track of which medications you have taken, foods that might have triggered an attack or charting the time you are disabled is more than you feel up to. Yet, giving your physician the correct data about your headaches is essential to getting the best headache care. Luckily, there’s help for you here. 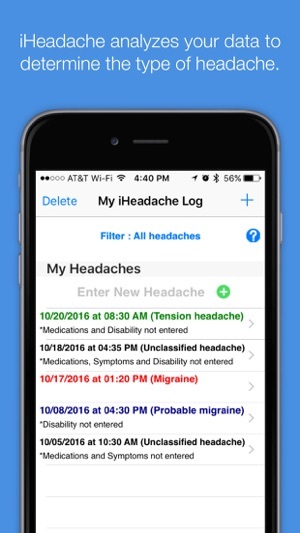 iHeadache has everything you need to track your headache symptoms, disability, triggers and medications in a pain-free way. 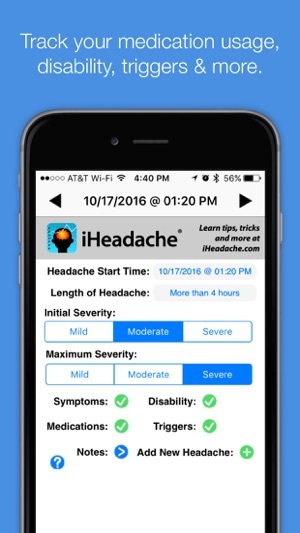 With iHeadache, your iPhone becomes a headache diary that’s going to help you and your doctor diagnose and treat your pain. iHeadache was developed by neurologist, researcher and headache specialist, Dr. Brian D. Loftus. Who better than a specialist to create the most accurate and important headache tracking tool available? 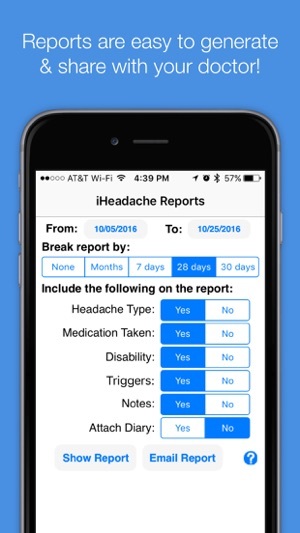 One of the unique features of iHeadache is that it can tell you the type of headache you’re having by capturing and analyzing real time information. 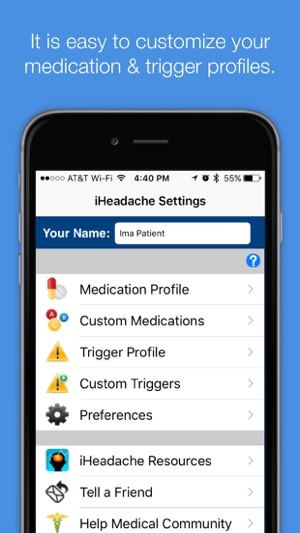 The app uses criteria specified by the International Headache Society to classify your headache as a migraine, probable migraine, tension headache or unclassified headache. 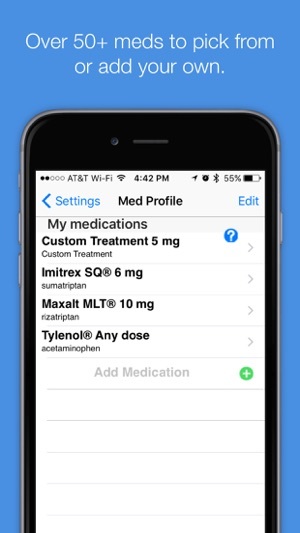 This application is like having a doctor in your device. What kind of information does iHeadache track, record and analyze? The information and analysis units in iHeadache have been designed to help you and your doctor design an informed, optimized treatment plan. The report is specifically formatted so your physician can quickly analyze the data about your headaches. You can even choose to export your diary to a CSV file that can be opened in Excel, Numbers or other spreadsheet applications. 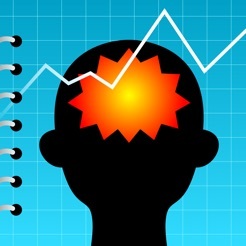 Visit www.iHeadache.com to view the user manual, video tutorials, and quick start guide. If you’d like to learn more about headaches or Dr. Loftus, please visit www.BellaireNeurology.com. Why on earth would you want to suffer more or longer than you have to? Get iHeadache now and help your doctor help you. I like this app a lot. You can get “reports” based on the info you enter and you can get that info organized monthly or weekly. This has been extremely helpful when talking with my doctor about my headaches. It might be nice to be able to view some of the info in GRAPH form right in the app, but even without that, it has been VERY useful! I downloaded this app to compare with another headache tracker I use. Unfortunately for me the app is not user friendly and a bit confusing to use. 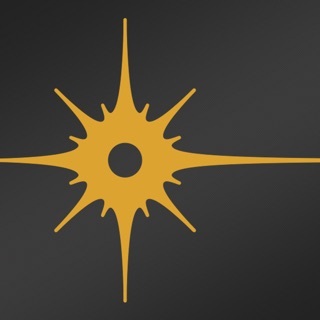 I also wish there was more detail. Finally, I’m a bit confused why everything is classified as a “probable migraine” when what I have entered doesn’t point to a migraine at all.